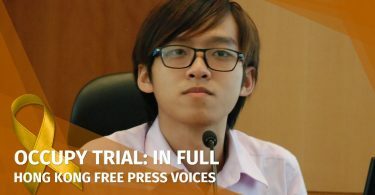 Raphael Wong was among nine leading Umbrella Movement activists found guilty of public nuisance for their involvement in the 2014 pro-democracy protests on Tuesday. His legal team have shared Wong’s final submission to the court ahead of his sentencing. He read out a Chinese version in court on Wednesday morning. It has been eight years since I have met you in court. You were the judge to my case on disorder in public places. It was in 2011 and I was only 23 years old. I chased after the then Chief Executive Mr Donald Tsang and asked if he knew the price of rice and whether he understood the struggles of the poor. Fate has brought us here again, I am before you once again, but I am no longer the young man who was acquitted. When you are reading this statement, I am a “recidivist,” ready to be sent to prison for the third time. However, I do not seek your mercy today, but wish to explain the reasons for my participation in the Umbrella Movement and civil disobedience, so that your honour can give a reasonable sentence through understanding my motives and actions. Our positions have slightly altered in the past eight years, but not as great as the changes that took place in Hong Kong. The controversial big white elephant infrastructures were completed. More tourists are visiting, making Hong Kong a bustling city. At the same time, however, more poor people are living in subdivided flats, more people are forced to the street to protest, more young people are sent to jail. Things we wouldn’t have imagined eight years are now happening in Hong Kong. When I was before you eight years ago, we would not have imagined Hong Kong people could be kidnapped by the Chinese authority to mainland China. We wouldn’t have imagined that one day, the mainland law enforcement officers could perform their duties in Hong Kong. We wouldn’t have imagined, not only could the Communist Chinese government interpret our law, but they could decide on our future and tightened the rule on constitutional rights through the National People’s Congress [NPC] Decision. Is democracy just a slogan? Eight years ago, I criticised the then Chief Executive Mr Donald Tsang for ignoring the interests of one million poor people and 300,000 elderlies. I scolded him for celebrating the 1911 Revolution without understanding its preliminary belief. I called for the establishment of universal retirement protection and the abolition of [Mandatory Provident Fund] MPF, and was arrested for the first time. Yet, there are still over a million poor people in Hong Kong today, with more than 300,000 of poor elderlies. The disparity between the rich and the poor and housing problem has only gotten worse. In 2014, I witnessed a 75-year-old man kneeling before the Secretary for Labour and Welfare Mr Matthew Cheung Kin-Chung at a public hearing in the Legislative Council. The old man begged the government not to demolish the elderly home in Kwu Tung Dills Corner. In 2019, a 67-year-old woman, who scavenges for cardboards to make a living, cried during the Legislative Council public hearing. She cried because it was impossible for her to get a job. The Secretary for Labour and Welfare Mr Law Chi-Kwong simply told her to ask for help in the Labour Department. Why are the government officials so callous? Why have our opinions failed to affect the government’s administration? 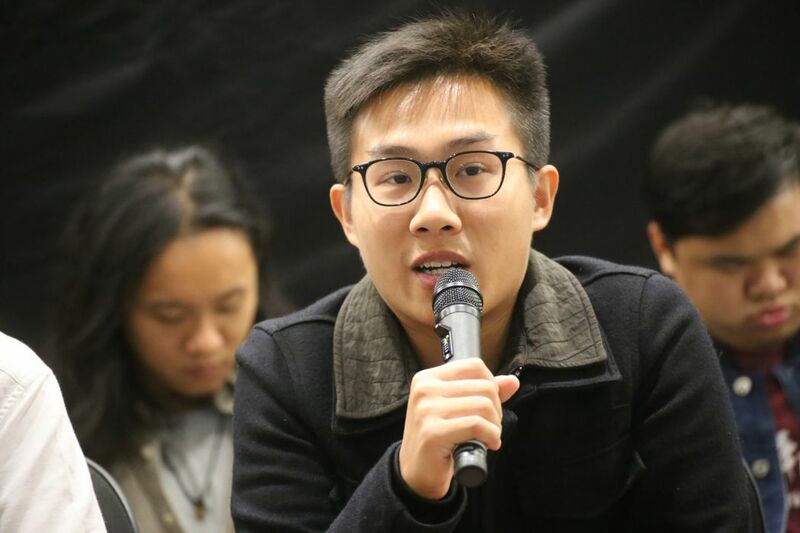 The root of the problem is that Hong Kong people do not have real choices, we have been deprived of the power to supervise the government and to formulate policies. What is democracy? Democracy means people are the masters. Any policies should be supervised by the people, the society’s resources should be justly distributed to improve the public services so that the poor are no longer in poverty. However, in today’s Hong Kong, the focus is on the mainland China, there is collusion between the government and the businesses, there is a great disparity between the rich and the poor, and multi-billion-dollar big white elephant cross-border infrastructure are built one after another. Nurses die from overexertion at work, teachers commit suicide and old man kneels to beg for what he deserves. Yet, the government policies were only minor repairs here and there, giving small treats and favours to the people. How can you win the support of the people? From the civil disobedience movement in 1966 by So Sau-chung and Lo Kei against the increase of Star Ferry fare, until the 1967 riots and 1989 China Patriotic Democratic Movement, even the 2003 march against the purported legislation of Article 23, they were all due to the political dictatorship, imbalance policies as well as unfair distribution of public resources. It is for these reasons that led to large scale protests. It is for the same reason that the 2014 Umbrella Movement started. For so many years, Hong Kong people have been fighting for democracy. We demand a just allocation, a life with dignity and space of freedom. However, what do we get in return? On the eve of the signing of the Joint Declaration in 1984, the then premier of the Communist Chinese government Zhao Ziyang in his reply to the demand for democracy and universal suffrage by the University of Hong Kong Student Council clearly promised that “what you referred to, namely ‘rule Hong Kong by democracy’ is a matter that goes without saying.” At the time, a lot of Hong Kong people believed it. They thought they would have democracy after the handover. However, since the bloody suppression on 4th June 1989 and the 500,000 people demonstration against Article 23 in 2003, the plot of the Chinese communist revealed itself. They decided by force through the NPC interpretation in 2004 that there would be no universal suffrage of the Chief Executive and the Legislative Council in 2007 and 2008. Since then, the undemocratic authority of NPC kept a tight grip on the destiny of Hong Kong people. 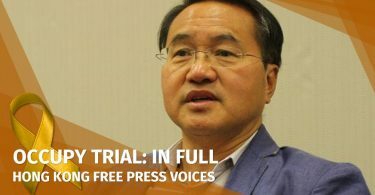 NPC’s interpretation and decisions can be deployed anytime when convenient to assist the propaganda of the authoritative government, forcing the hands of the Hong Kong court and suppressing Hong Kong democracy and the rule of law. 31st August 2014 was a turning point in history. No matter how the moderate scholars tried to persuade it from happening, the Communist Chinese government has used the One Country Two System white paper in June as the foundation and forced its way down onto the people. Even your honour was among them, succumbed to the so-called patriotism. After the 8.31 Decision of the [NPC], the plot of the Communist Chinese government has revealed itself, the Chinese government has been lying to the Hong Kong people, they never intended to give Hong Kong genuine universal suffrage. At that time, we believed that civil disobedience was inevitable and was the only way out. The recent decision by the Court of Appeal concerning the Civic Square outside the government headquarter (Secretary for Justice v Wong Chi Fung (2018) 21 HKCFAR 35) also confirmed the idea of civil disobedience (paragraphs 70-72 of the judgment refer). This, therefore, confirmed that myself and the other eight defendants as well as other civil disobedience protestors, should not be understood as “breaking the law” in its general circumstances, nor should our sentencing be weighted against the usual standard. Hong Kong people have been fighting for democracy through protest for 30 years already, whether it was during the times of colonial British rule or during the special administrative region, there has been no improvement. Today, we fought for democracy, just as the fights for freedom and democracy in India, South Africa and Poland, and civil disobedience is inevitable. It is true that we did not want to block the roads or affect Hong Kong citizens attending to work or school. But on reflection, didn’t the Communist Chinese and Special Administrative governments block our road to democracy and interfere with our rights to speak up? If what I did was in the name of civil disobedience, why should I defend my case and not bear the criminal responsibility? In December 2014, the police made use of the statutory offences of “attending an unauthorised assembly and inciting participation in unauthorised assembly” and arrested me at the village I live in. Coincidentally, the then Court of Appeal Honourable Mr Justice Robert Tang Kwok-ching stated in his retirement speech in 2018 that, “Common law can be used oppressively. It is protean power unless adequately controlled by the proper application of human rights law, can be misused.” What he said has become true today. Faced with 2 charges, I am going to stand by reasons and my principles, in order to assist the court to overturn an unjust prosecution. However, should the court find me guilty, I shall bear the criminal responsibility. I have no qualm or regrets, in fulfilment of my chosen path of civil disobedience. Who has not yet awoken? I do reflect as to whether I am simply seeking a criminal sentence in order to make a point or to encourage other young men to follow my footsteps into the gates of the prison. I have reflected upon this repeatedly. However, my answer is that I am doing this precisely because I do not wish to see other young men following my suit into the prison. As a result of this, I need to fight for what is ours fearlessly. Although today we are confronted by an oppressive authority, the looming legislation of unjust laws and a clouded future, I shall be as I always am: relentless maintaining my stance that a real election is a path to freedom for Hong Kong people. Anyone who claims to be acting in the interest of the next generation should fight for a free and equal choice for their youths. This is in order for them to learn to be independent, to be able to tell rights from wrongs. There should be no paternal thinking, simply teaching the next generation to be slaves of money and accessories to the oppressor. My Lord Jesus Christ has said: “Very truly I tell you, unless a kernel of wheat falls to the ground and dies, it remains only a single seed. But if it dies, it produces many seeds” (Book of John 12:24.). Without sacrifice, there is no reward. I don’t wish to see any more young men having to join the path of civil disobedience as I did and to pay the price as I did. However, I ask this of all men and women of wisdom: if peaceful demonstration in the old fashioned way has lost its effectiveness and was simply ignored, why is peaceful civil disobedience not a good way to bring about change whilst one is being oppressed? If not for this crowd movement, CY Leung would still be sitting comfortably on the throne. I have no mitigation to submit. I only wish that the Court would spare Reverend Chu, who is an elderly of 75 years of age. I pray that a non-custodial sentence may be passed for Reverend Chu. I hope that the Court will have leniency and mercy for Reverend Chu. I refer to the work of the American legal philosopher Ronald Dworkin in 1968, namely: “On Not Prosecuting Civil Disobedience.” He opined that not only should the court allow leniency to civil disobedience participants, but also should they not be prosecuted. In fact, Lord Hoffmann NPJ of the CFA stated the following in an interview with Apple Daily and South China Morning Post on 4th December 2014 (which was at the end of the Umbrella Movement, a day before the surrender of the 3 initiators of the Occupy Central Movement): “In any civilised society, there is room for people making political points by civil disobedience, ‘these are not wicked people.’ Civil disobedience had ‘an old tradition’ in the common law world. ‘When it comes to punishment, the court should take into account their personal convictions’.” In light of this, I hope the court shall pass a humane sentence. Your honour, I have no regret for participating in the Umbrella Movement and the fight for democracy. It was an honour of a lifetime. I have spent the best 10 years of my youth in social movements. If I can live up to 80-year-old, I would still have 50 years to walk alongside the people of Hong Kong, to continue the fight. If this is in doubt, please test my will against the whips of criminal punishment. I shall take this as a trial of my determination. I only hope that my brothers and sisters-in-arms can be inspired whilst I am imprisoned, to do goods and encourage others. I hope they shall have further courage and strength to be honest men and women, to fight against the lies of the ruling Chinese Communist authority. “Hope lies in the hands of the people, change starts from resistance.” It’s only through the power of the people and direct action that society can be changed. This was so 8 years ago. This is still the case today. May the will of the people of Hong Kong be firm and determined, to fight for democracy, overthrow the privileged, and let justice be done. All hail for freedom! All hail for democratic socialism! May justice and peace of my Lord Jesus Christ be with me, with your Honour and with the People of Hong Kong!